A few more hours and we'll be ringing in the New Year - although the fireworks have started around my house already. I'm listening to the wind howl outside, cozy and warm in my fleecy jammies, and grateful to be able to stay indoors. Not sure what the temp is but baby it's COLD outside. There's a Cary Grant marathon on one of my movie channels tonight, can't think of anything better - An Affair To Remember just started. *sob* Bliss. This BOM from Jenny is a must. 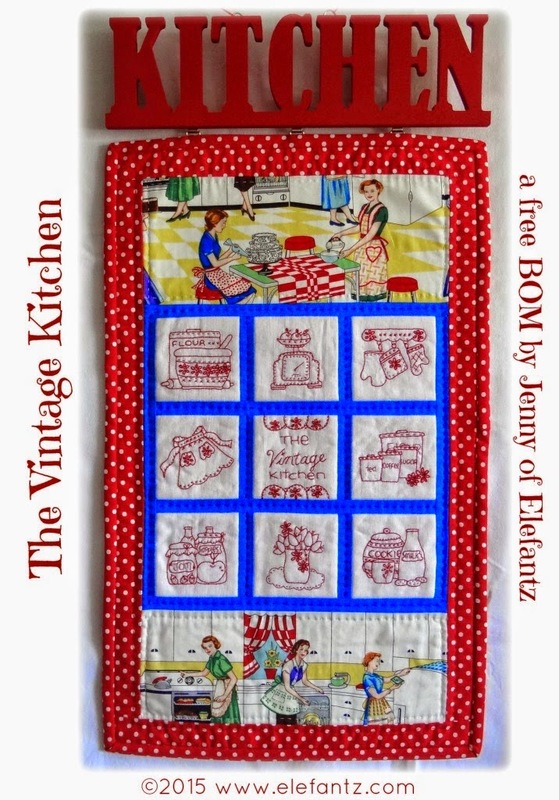 Block 1 is ready, go visit to download - just click here - The Vintage Kitchen. And of course Jenny's Stitchery Club, and anything else that girl churns out! I have the perfect fabric for this and can't wait to use it. Other than those fun things, I also want 2015 to include lots of drawing, pattern-making, and hopefully a new job - health and happiness for my loved ones, and all my bloggy friends - a year of rejoicing. Blessings to all of you, my friends, and best wishes for this coming year! Wishing you a Happy New Year Allie! May the bountiful blessings of our sweet Father in Heaven be poured out upon you and yours in 2015, Allie-girl. Happy New Year Allie! Try to stay warm. The wind is really blowing tonight. My goal is to unclutter my mind so i can concentrate on making new things and finishing the old and enjoying the process. Threading My Way Pam and I are challenging each other to meet some goals each month - they mainly involve getting gifts made on time, and I want to try a bunch of NEW things this year, so that's my main goal : I'd love to lose a chunk of weight but I'm more interested in feeling better and getting more flexible - the Aquafit classes are really helping with that, so I'm going to try my hardest to keep up with them! Here's to health and happiness in 2015! Happy New Year Allie! It's cold here too. I'm snuggled under a quilt as it is around 13 outside and we don't have the fire going very strong yet this morning as it is early enough I should still be sleeping. Oh well. Jenny's new quilt is cute. She does come up with great projects ... as do you my very talented friend. Oh, Allie, I love that thought - A Year of Rejoicing! I'm going to steal that idea right now! Thank you! I hope to see many wonderful designs from your pencil this year. You are so creative and I love the things you dream up. What you do is different from Jenny, but no less appealing. Happy New Year, Allie! Thank you for all the kindness and support you extended to me. Bless you, my friend!! I saved the pattern but I don't envision having time to do the stitching. There are so many temptations in January for new free block of the month designs. Thank you for sharing the link to Jenny's pattern. I love that sentiment, Allie. A year of rejoicing....now, that's worth putting on my sewing machine. Happy New Year to you and yours, Dear, and may in 2015 we all continue to be blessed with Health and Happiness. Love that song....baby it's cold outside. Hope you had a great New Year. We spent ours in Austin at the Hyatt with the girls. No fireworks this year...:( They cancelled them because of the weather....it didn't even freeze....People in Texas are afraid of the ice for sure. How Many Makes A Flock?